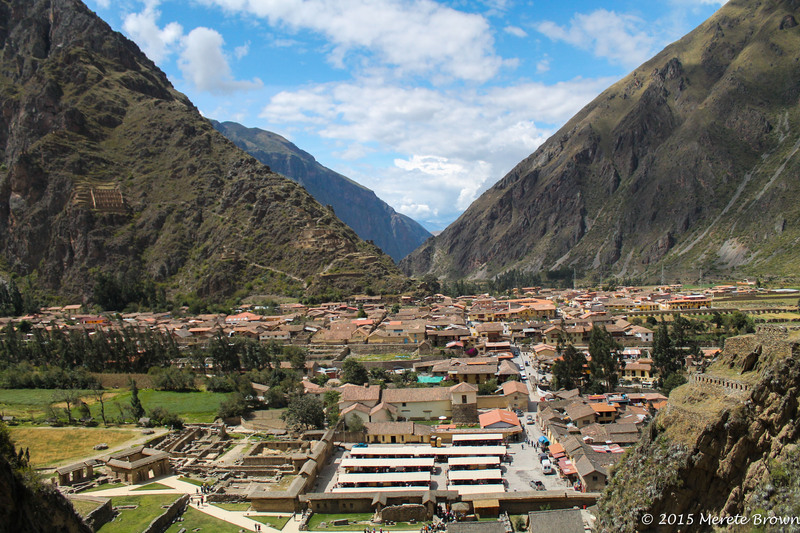 We left the sanctuary of the Aranwa Sacred Valley Hotel and headed towards Ollantaytambo via taxi to catch the train to Aguas Calientes. 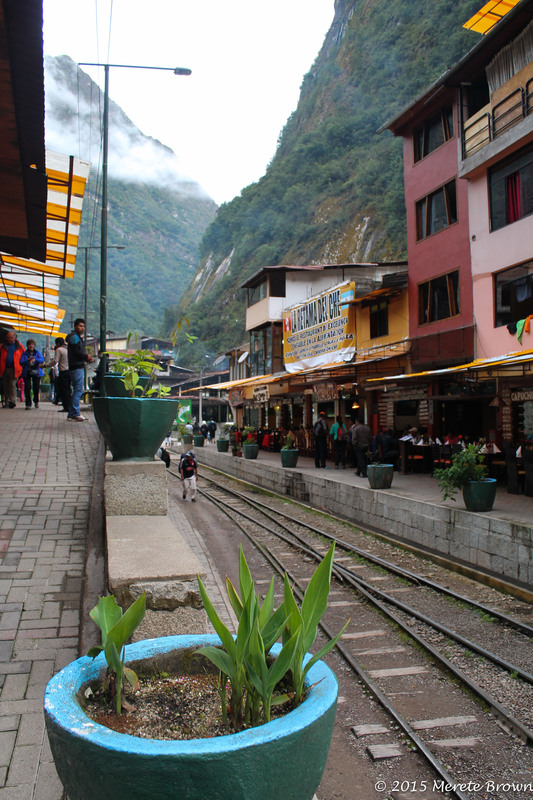 Tucked away in the upper Amazon Basin and only accessible by train, on the eastern slopes of the Andes, Agua Calientes sits at the base of Machu Picchu. 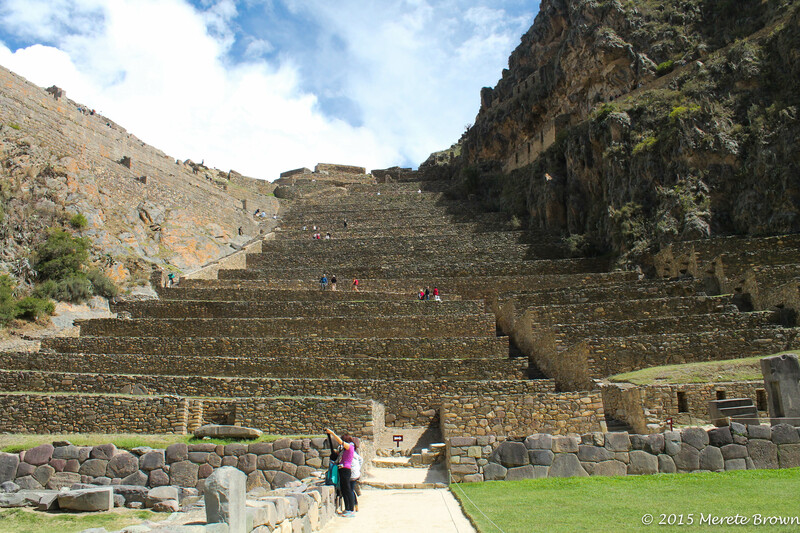 The day would soon arrive when we would be standing at the top of the famed archeological find but not before stopping off at the ruins of Ollantaytambo. 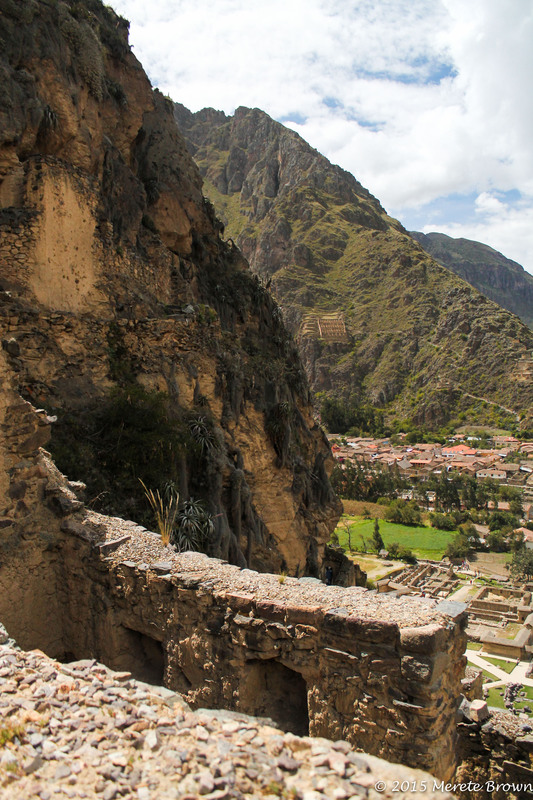 Ollantaytambo was once the royal estate of Emperor Pachacuti and a military stronghold for Manco Inca Yupanqui, the leader of the Inca resistance. 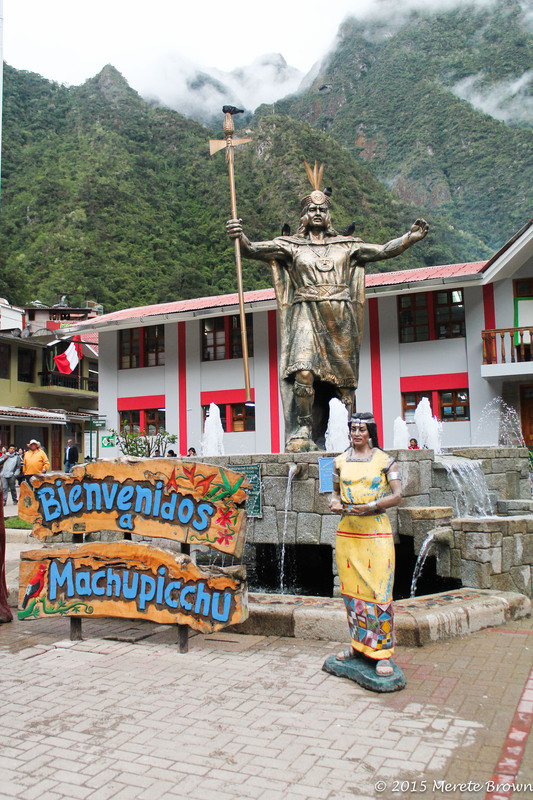 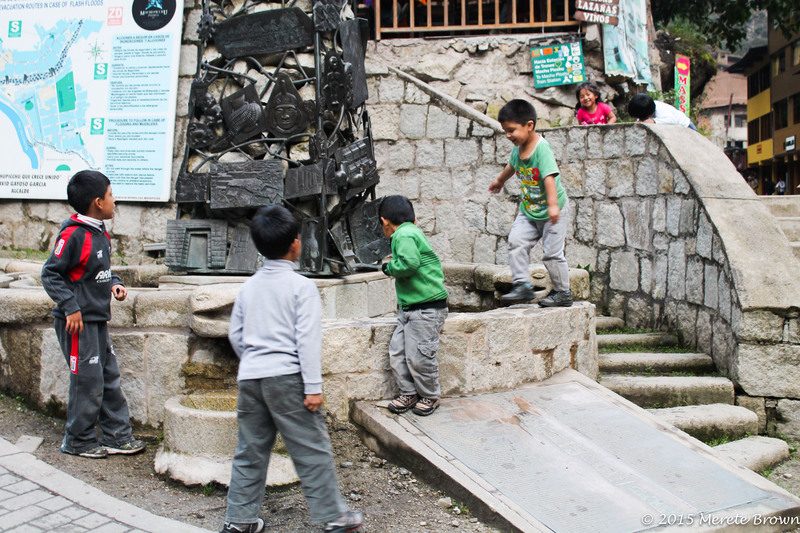 Today, it’s the most common starting point for the trek on the Inca trail to Machu Picchu. 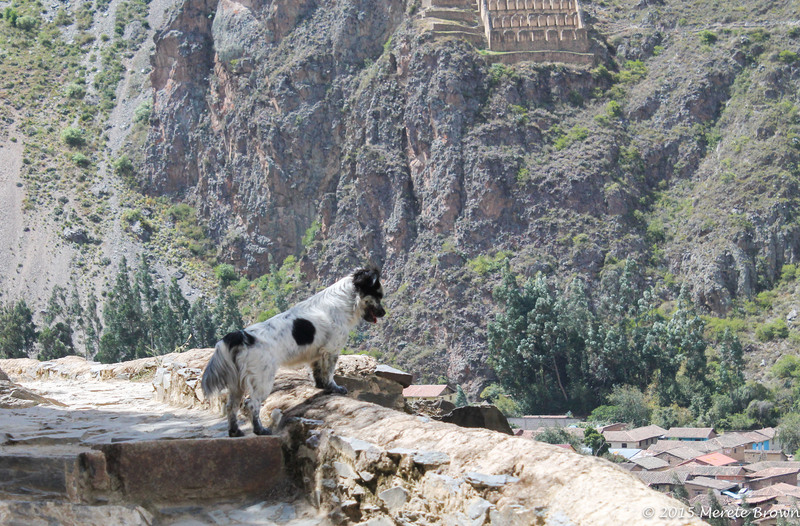 As we hiked up the ruins, we made a friend along the way, a small mixed-breed dog guarding the ruins. 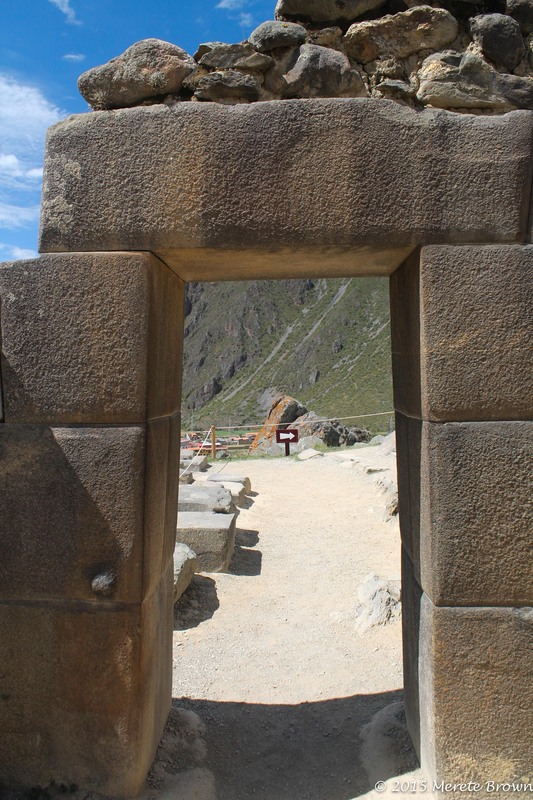 We walked through door after door, along the intertwining paths, far above the people below. 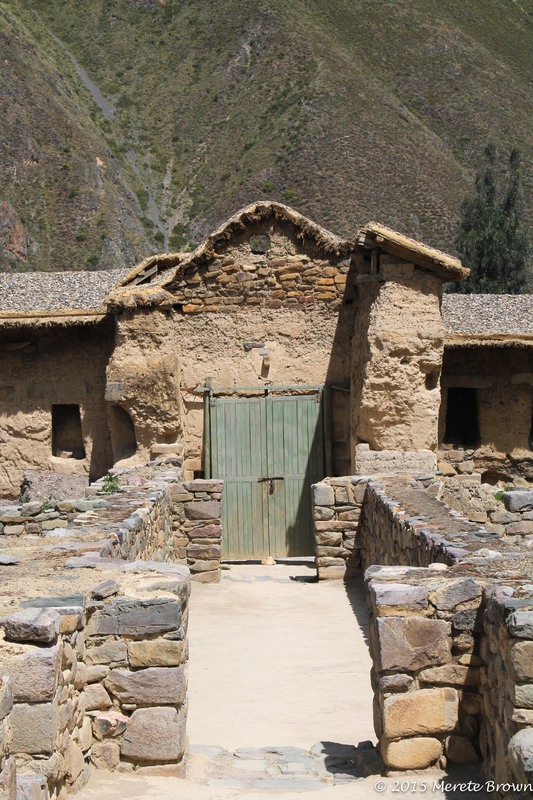 Each time we would visit a new ruin, it sparked my imagination, picturing how the Incas lived so long ago. 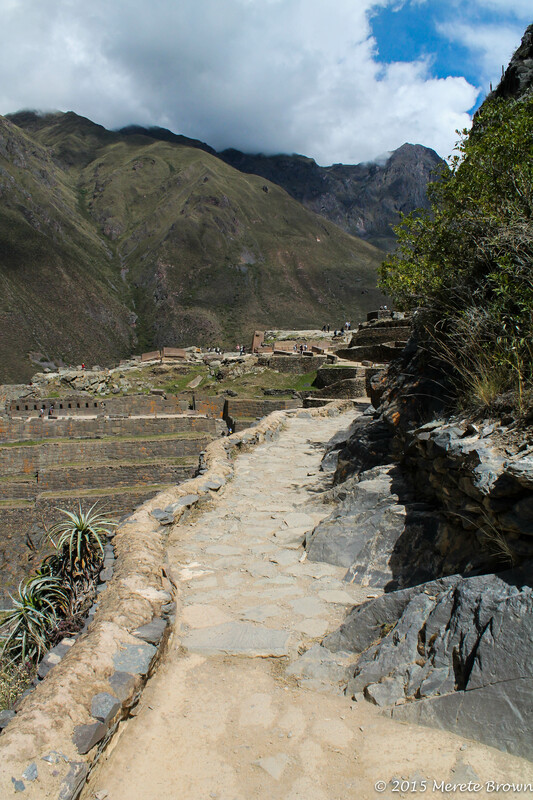 There was nothing left but ruins, but yet the sites were so surreal complete with terraces, storehouse and quarries. 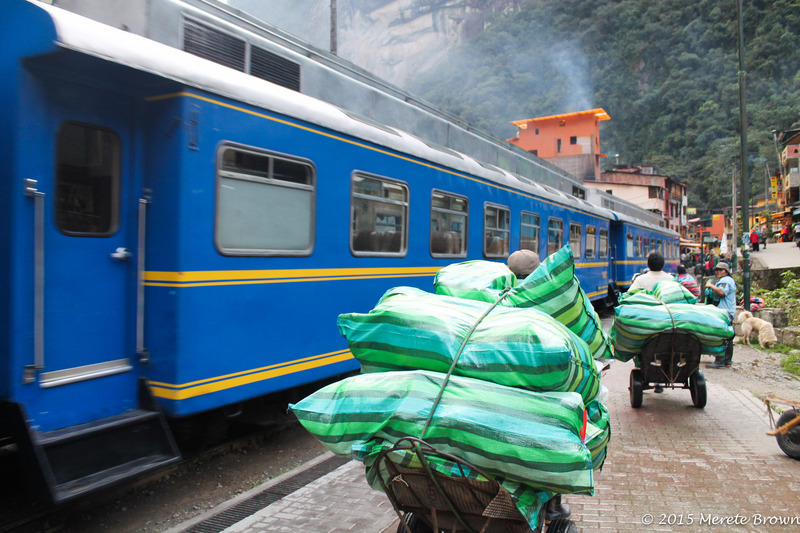 Our limited time at the ruins was up, so we strolled down to the train station in time to catch the train on the PeruRail Vistadome. 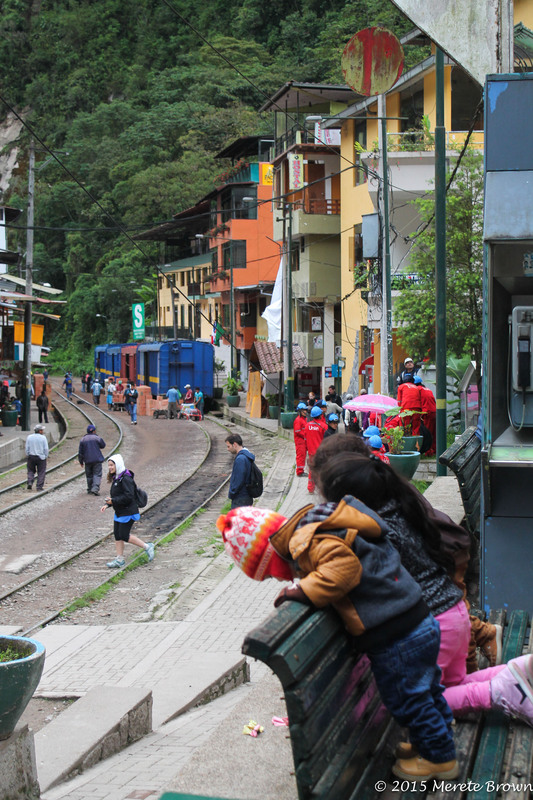 Although there are several different trains you can take to Aguas Calientes, the Vistadome has windows in the top of the train for a more panoramic view as you travel deep into the jungle. 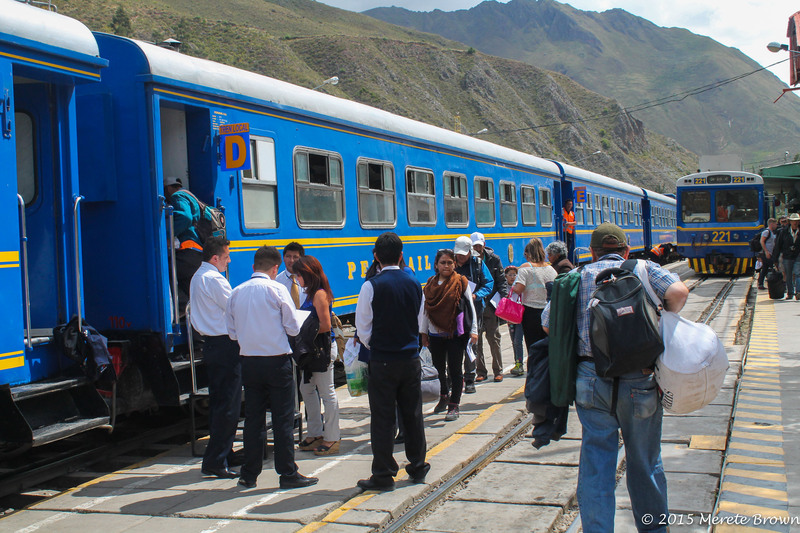 For information on train tickets to Aqua Calientes, visit PeruRail. 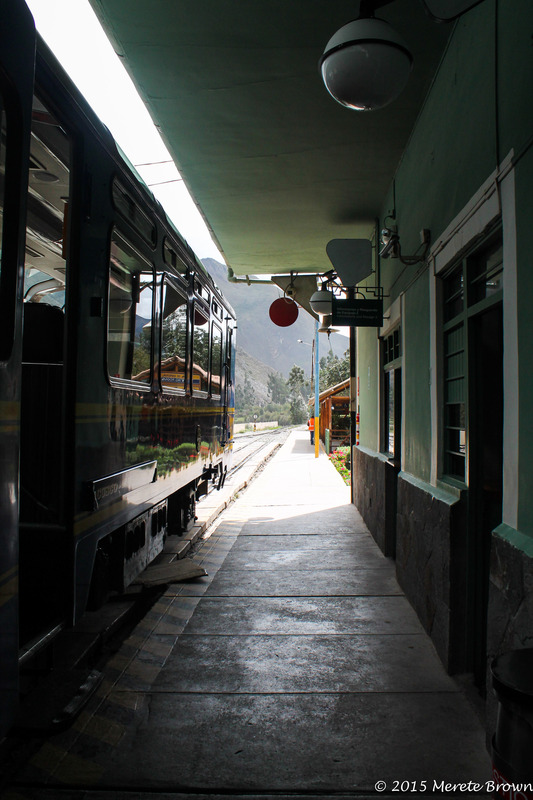 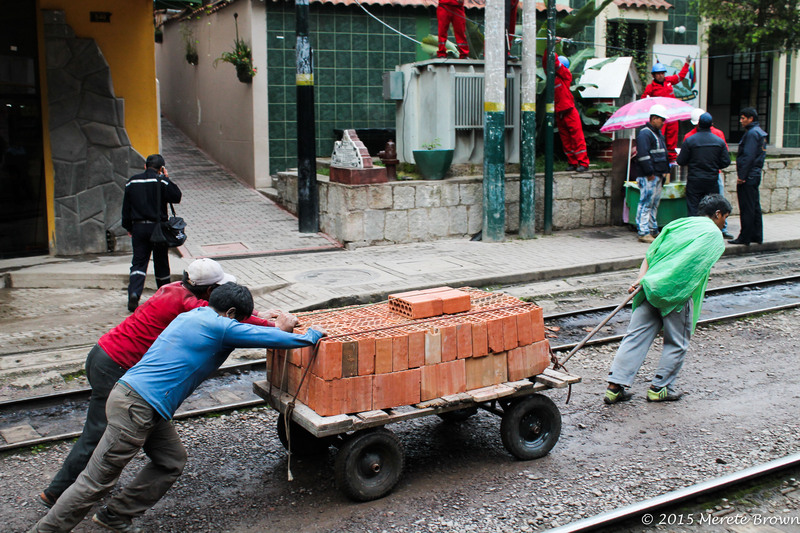 Besides Ollantaytambo, you can also catch the train from Poroy (near Cusco). 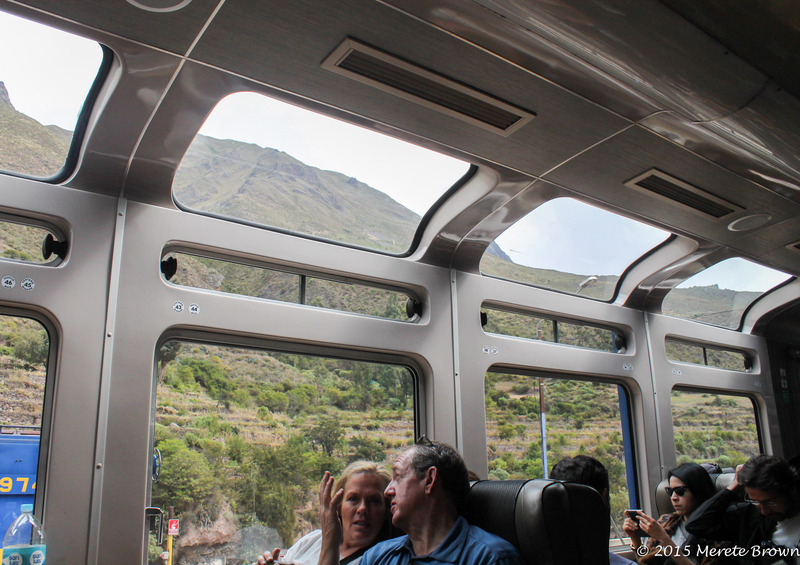 As the train pulled away from Ollantaytambo and started to traverse through the mountains, the scenery quickly changed. 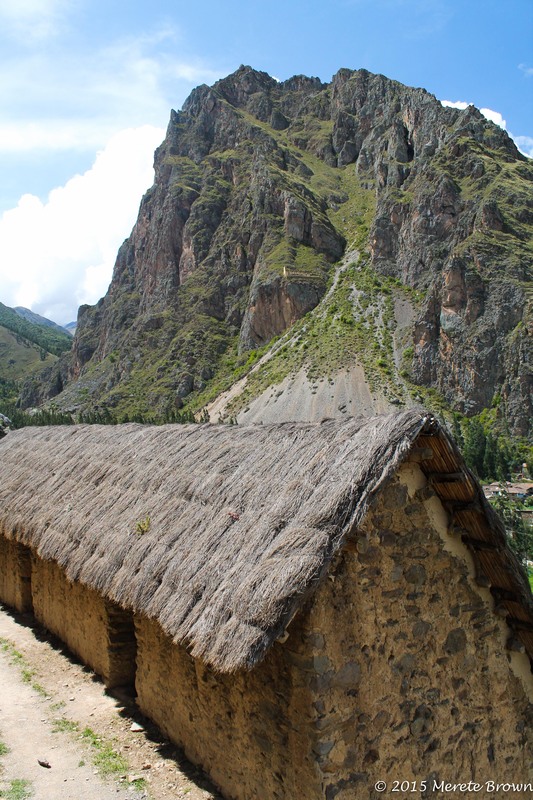 Countryside farms soon turned into steep raised cliffs full of rich green vegetation along the Rio Vilcanota. 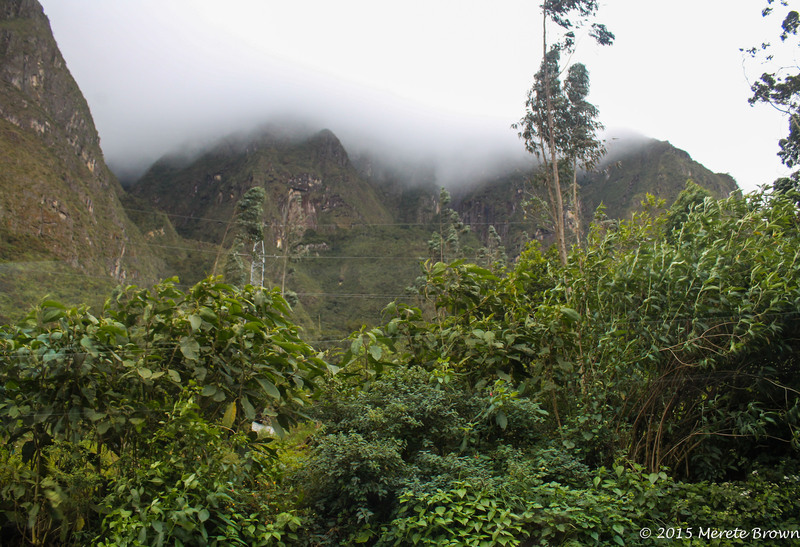 By the time we arrived in Aquas Calientes, the desert valley was a memory transformed into a Narnia like scene of tropical mystery. 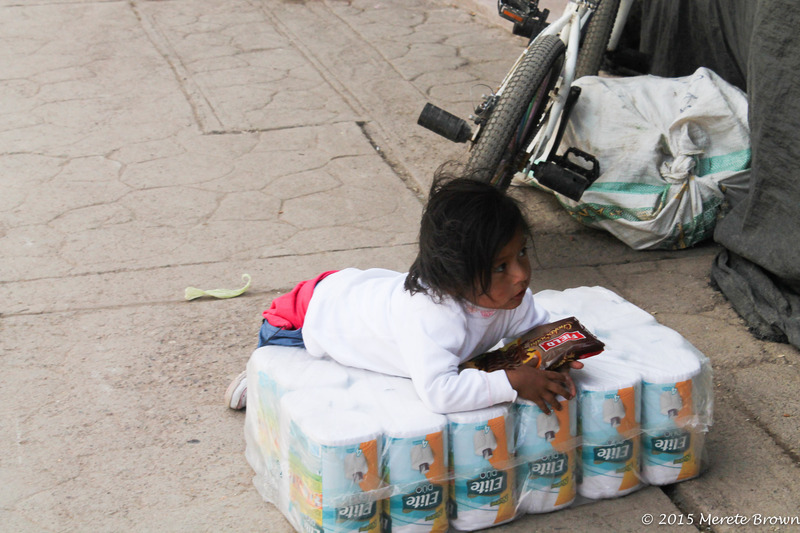 We arrived just in time for dinner. 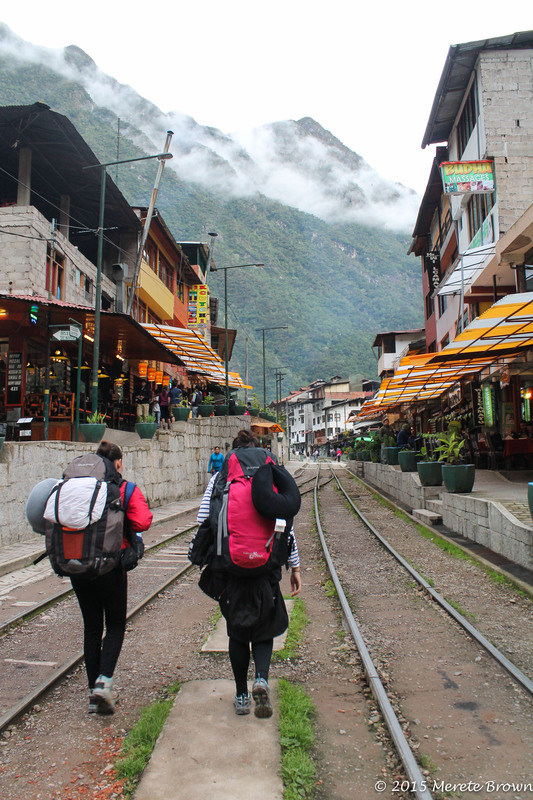 The small village at the base of Machu Picchu was bustling, a hosh posh of tourist traps and hotels, tired backpackers, rambunctious kids and local workers trudging up and down the tracks, finishing their work for the day. 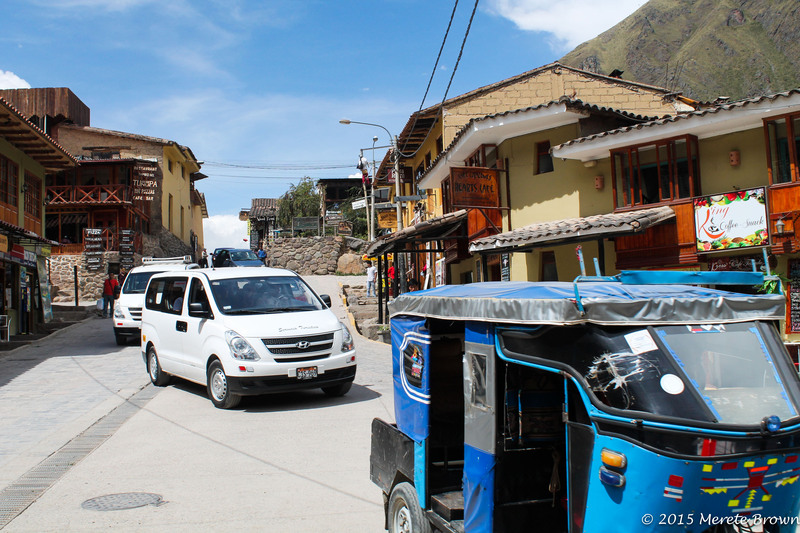 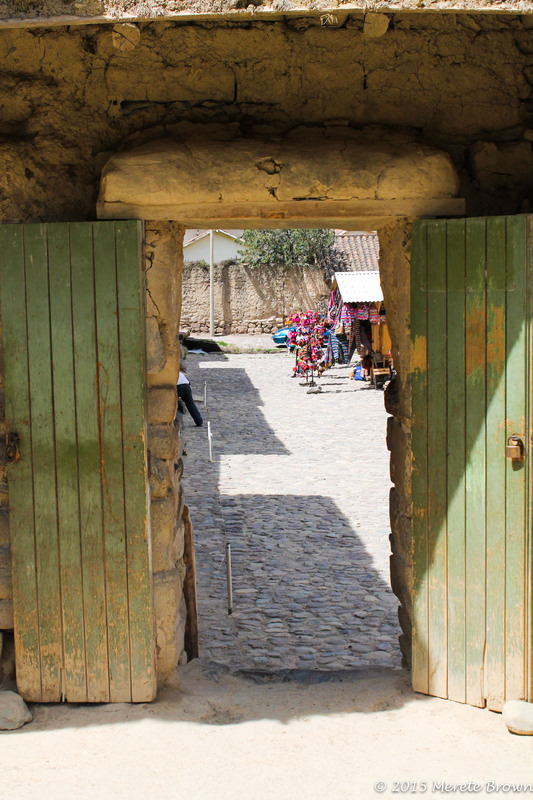 Color sprouted up throughout the village in every fine detail from the buildings to the Peruvian trinkets. 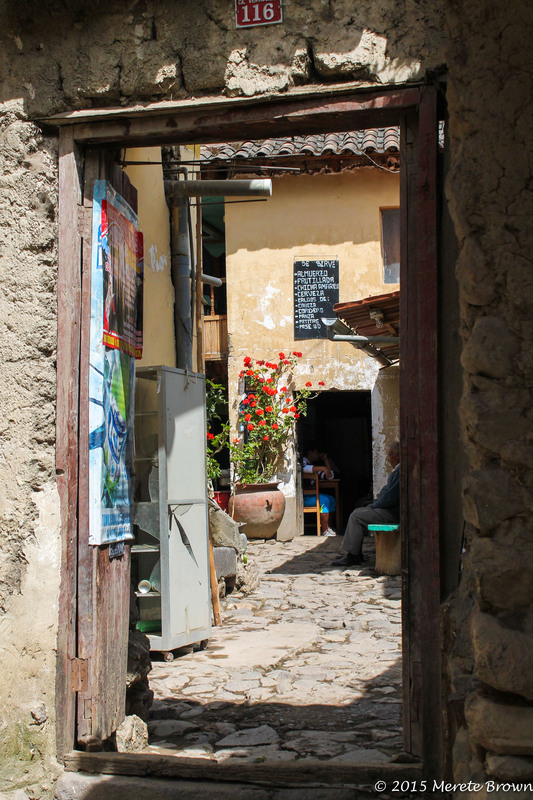 The village was full of life. 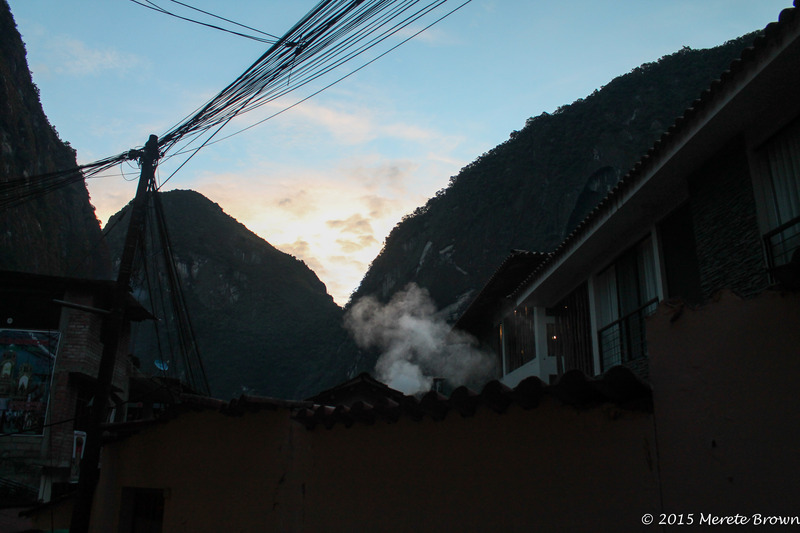 As the sun fell slowly behind the towering mountains, it finally hit. 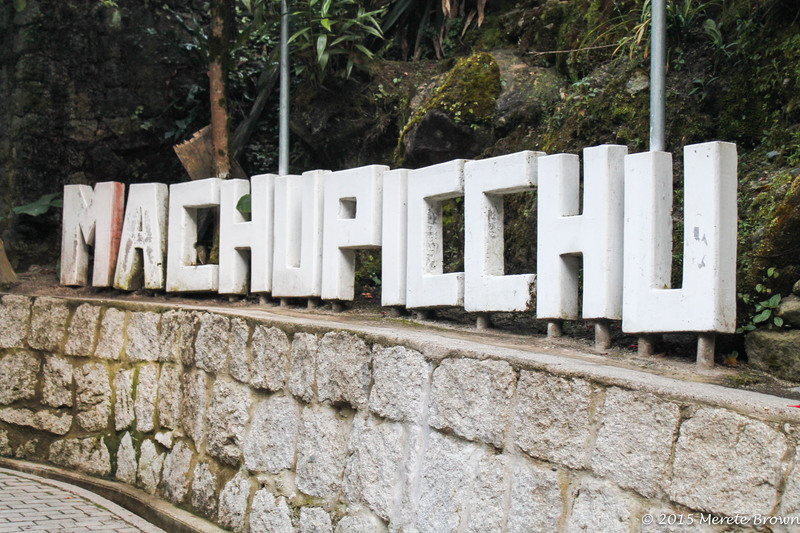 We were at the base of Machu Picchu. 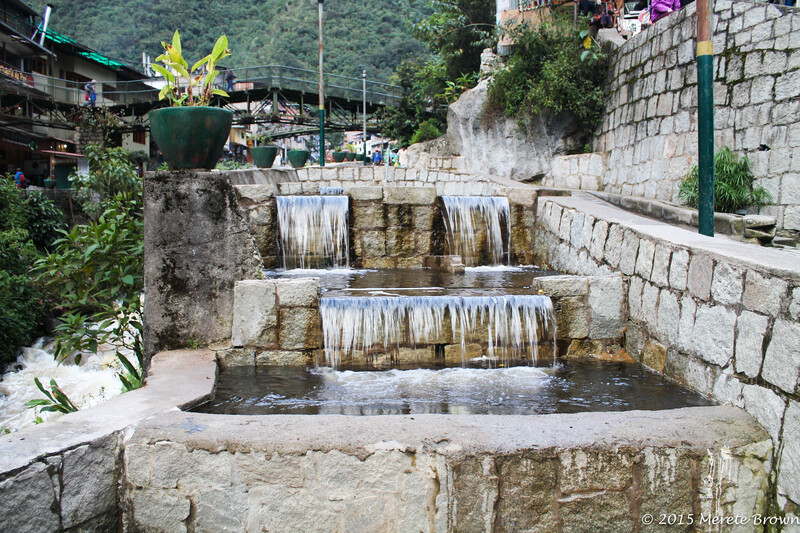 A dream that materialized overnight. 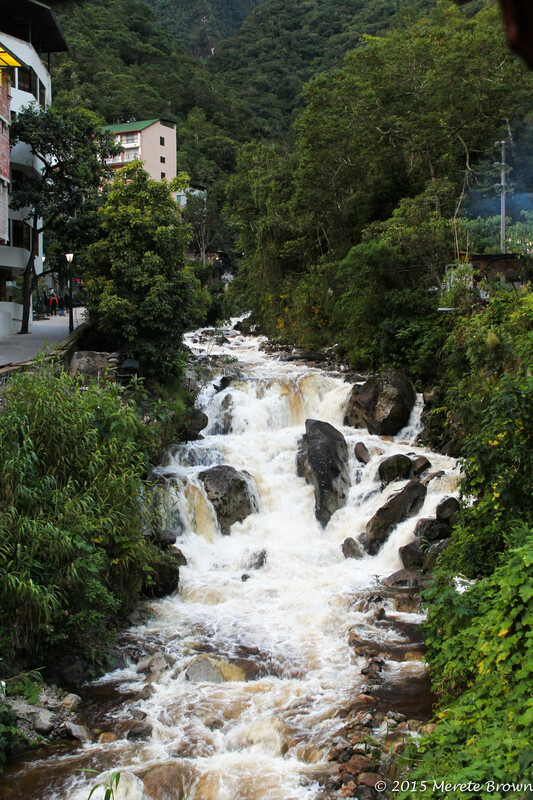 One thing was for sure, I felt alive.